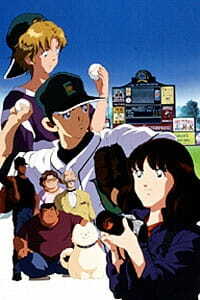 Trying to find his own game of baseball, and not that of his brothers, Tatsuya moves to America and pitches for a poor, struggling minor league baseball team called the Emeralds. Meanwhile, Minami is still in Japan, trying to find her own path after quitting gymnastics. Inspired by a photograph of her final performance, she becomes the photographers assisstant. If you watched the prequel to "Touch: Cross Road - Kaze no Yukue" then you might as well watch this special to see further development between Tatsuya and Minami. The concept revolves around Tatsuya finding his own baseball in a place where Kazuya's shadow isn't constantly following him every time he plays baseball. And for Minami to find herself in general. All towards the vision that when they find themselves they can finally be together and sure of themselves. I hope I didn't over sell this special. Anyways if your a fan of the series, watch this special.